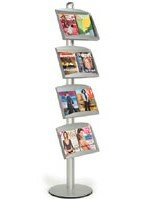 Eight double sized pockets on this literature display stand from Snapframes.com can hold a variety of information! 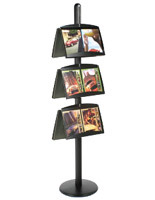 Our FORTE literature display stand features 8 double wide (18-1/4") pockets for almost any size literature and brochures. 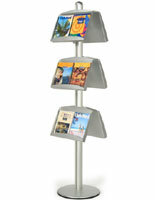 A support arm allows you to even display heavier literature such as books or manuals without "weighing down" the shelves. The 1-1/2" deep pockets can hold side by side magazines, standard literature or even single stacks of large format catalogs. 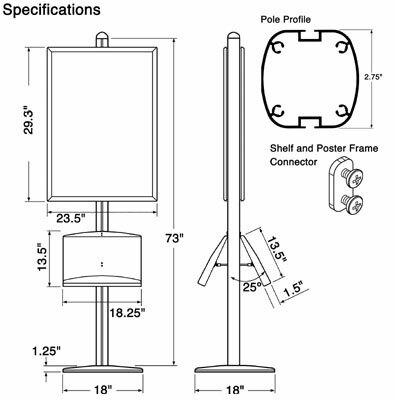 Each of the brochure pockets is constructed of sturdy steel with a connector arm that slants your literature upwards at a 25 degree angle. 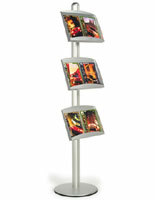 The powder coated finish assures that your shelves will resist chipping and scratching. Four pockets on either side give you the opportunity to catch the interest of people passing on either side. 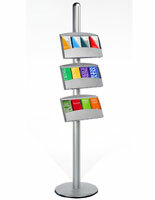 With the ingenious "channel" design of this literature display stand you can adjust the shelves up and down to achieve the exact placement that you desire. The weighted FORTE base and aluminum pole weigh a generous 25 lbs ensuring that the display will not topple over or even wobble. A ring of rubber around the base also protects your floors from scratches.